First, you’re figuring out how much you already spend on food. Then you look at how much you should spend on food. Then you have to stick to what your budget says to spend on food. My head is already spinning. Learning how to make a frugal grocery budget sounds daunting, but when you break it down into simple steps it becomes achievable. 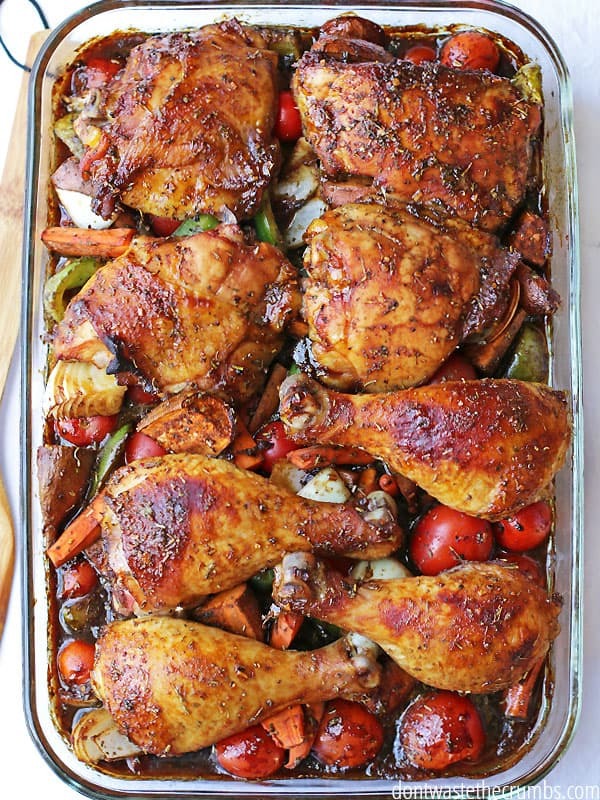 View meat differently – Let meat be a side dish rather than the main course. The meat you cook can complement the meal instead of star in the show. Eat meat less often – Plan for dishes that don’t use meat as your protein source. Slow cooker beans are a great way to have quality protein ready to add to any meal. Know a good price – Utilize a price book to know the cost of meat at your local stores and markets. Finding a good price might also mean buying in bulk from a local farmer. Buy quality over quantity – Go for lesser amounts of quality meat, like grass-fed beef or organic chicken, instead of large amounts of cheap meat. Again, buying from a local farmer can help a lot with the cost of quality meat. Change how you cook and serve meat – Shredded chicken and diced beef goes much further than whole breasts or steaks. Set aside portions reserved for other meals before the family digs in for dinner. Many of these meals use a cook-once-eat-twice mentality, using portions from one meal to make another. Keep that in mind if you swap out any of the recipes. 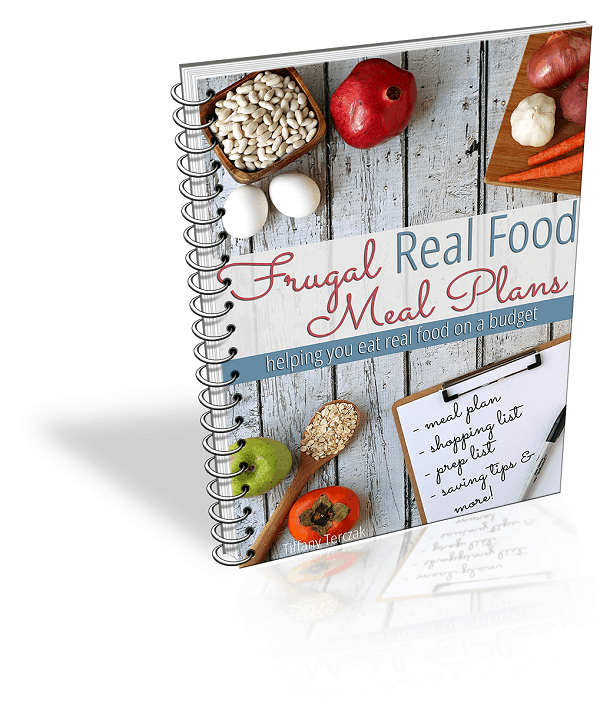 Look up the meal plan archives for more free whole food recipes and tips to saving money on real food. 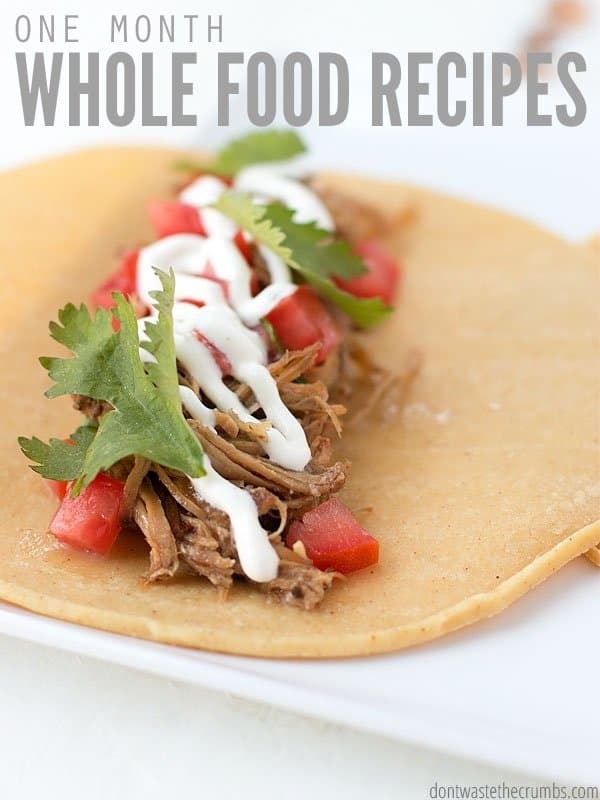 What’s on your whole food recipes meal plan? How would you go about finding local brands for meat? Would you look for local farms? The easiest way to find local meat brands is to see what the local grocery stores offer. See what they advertise and walk through the store to view what’s on display. There will inevitably be the store-brands (which may be harder to trace the source of), but sometimes you will see other brands too. In my case, I kept seeing “Harris Ranch Reserve” on packages and just Googled them one day, wondering if they were local or just a massive brand shipped to my stores. Turns out they’re based in CA and follow the practices outlined in the post! If you have time, look up the store brands too. Sometimes “good” brands are really not that great quality, like “Ranchers Reserve” sold by Safeway/Vons is fed both hormones and antibiotics (source). Yikes! Looking for a local farm is ideal, especially since you can talk with the farmer and cut out the middleman pricing, but it can require significant more leg work trying to find someone who actually knows the farmer and whether or not they sell directly. Starting at the store is easiest for now and when you’re ready to upgrade again, take a look at the farms. Even if you don’t find a quality brand, you’ll be educated enough to make the decision whether or not to eat that beef, or to use greater quality chicken instead. We buy grassfed beef and non-GMO pastured pork through a local farmer. My husband just googled and started calling local meat packing plants to get contact information for local farmers. You might have to find some friends to go in on the meat with you if you aren’t able to make a big one-time purchase or don’t have the freezer space to store a side of beef or whole pig, but price-wise, we’ve saved significantly! I really love all these suggestions! I like the way your menu plan adds doing a little prep work for the upcoming meals each day. What a great idea. Now, I am going to have to go check out the Starting Fresh series as I’ve been wanting to take us to a more plant-based diet but really had no idea how to start (I have a feeling the husband and kids will not like the idea but maybe if I do it gradually, they will complain a little less). Thanks for the input! The Fresh Start series is a great place to start. Leaning plant-based on meals is easier when it’s gradual. We started originally with salad nights, then added soup when the weather got cooler, made one meal a meatless stir-fry (when it was the end of the month and the meat was already set aside for something else). Gradually it became easier to make more meatless because we enjoyed the simplicity of it all. We do eat our fair share of animal products though – good butter and homemade yogurt (with organic cow’s milk) are staples in our kitchen! We’d be so lost without them! Thank you everyone for all the great information! Usually trying to budget for meat is not a problem for us because my husband is a hunter. This year however we have to put it back in. Hunting did not go as planned and there is a empty freezer in my garage. So we have gone to other meat types and cuts that we are not used to. It has been a learning process but we are getting there. We have found that the more whole you buy your meat and then you butcher the cheaper it is. Also I just found a local place that sells beef straight from the farmers so we are saving up to make a meat package purchase from them. We do go meatless for one or two meals a week but in order for my husband to stay off high blood pressure meds he needs to eat a protein rich diet. We have tried many other things but that works best so I would rather pay for the meat than the meds. We have started to add beans but for some of the kids that is an acquired taste. We have also been playing at making our own cheese and tried yogurt once (ummm I am not really sure what we actually made) but are getting ready to try again. I never thought of nuts. Most of the meat is consumed by my husband so we do some meatless meals for me and the kids and that is helping. Turkey season opens in April so I am hoping we will get some of those. This transition to real food is taking a toll on me. My kids are so old (youngest is 17) and trying to bulk up for football so meat is important to him and a lot of it! This is hard. Aw, hang in there Debbie! It’s definitely hard at first, which is why I always encourage small steps. It get’s a bit easier, although different changes are different levels of difficulty. 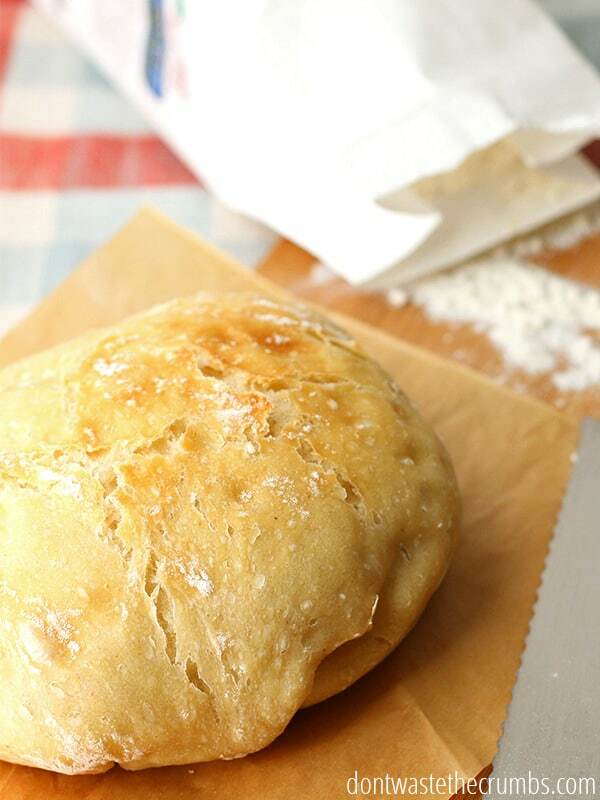 For us starting to use whole grains was tough – everyone could taste the difference. But going from 50% whole grain to 100% was a cinch, lol. Maybe a bounty of healthy fats and frugal on hand will help the meat situation: beans, cheese, avocado, hummus… and complex carbs too, not the simple ones! !